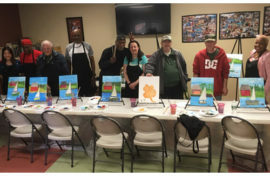 Basking Ridge, NJ (April 11, 2019) – Veteran residents and staff members at Valley Brook Village in Basking Ridge recently enjoyed a paint night in their honor, which was coordinated in conjunction with the YMCA Togetherhood Committee as one of their volunteer service projects. The Y’s Togetherhood program connects people from all backgrounds to plan and carry out volunteer projects that address a real need in their community. The Togetherhood Committee purchased refreshments and contributed the paint supplies and the instructor donated her time. 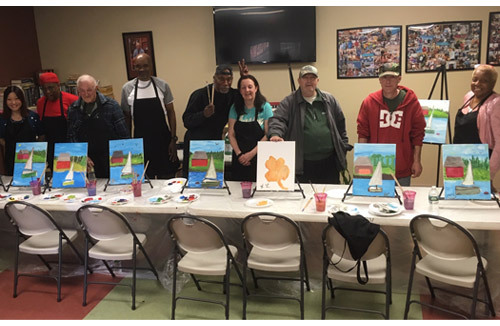 Pictured here (left to right): Jenny Irwin and Cornelius Charity, both staff members; residents William Selert, Benjy Moore, and Harriel Lacey; Joyce Lahmidi, owner/instructor at Elarah Paint & Wine; and residents Louis Liquori, Brian Cashel, and Cynthia Stokes.